I am back with yet another smexy outfit! I had bought this lace top last summer, never wore it until now. I was digging through my closet and found the lace top, and instantly was inspired to do a look like this! I am quite a sight to behold! The lonely girl's chips bag. So, I was partying with my friends on Saturday at a gay bar called DTM. It was my final visit, because it'll close down on new years eve and move to a new place or something. 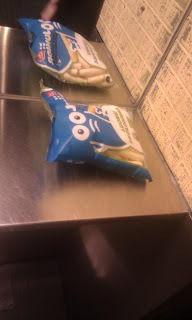 But anyway, as we went to the ladies bathroom, there was a unopened chips bag on the counter, or what ever you'd like to call those nasty things next to the sinks. Apparently the lonely girl had forgotten her bag of joy and support, as she washed her hands. Shame, how will she comfort herself now? When she lost her chips. She couldn't really start sucking the dust of the floors, now could she? Or well... No calories at least. Yes, I decided to get a bit inspired by Carmen Carrera. Hello!